There’s a lot to take in, but here are the main points to take away from Apple’s latest flagship device. 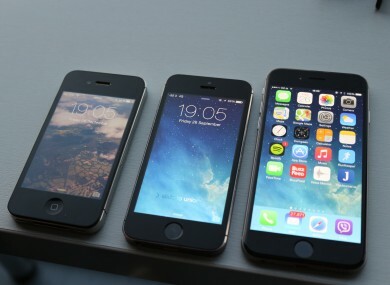 From left to right: the iPhone 4S, 5S and 6. WITH THE RELEASE of the iPhone 6 and 6 Plus happening today, the focus is very much on the phones themselves. We spent a little bit of time with the iPhone 6 today, and while a day isn’t enough to base an entire review on (that’s coming later), here are a few things that stood out for us. It’s incredibly smooth yet easy to hold. On top of being light, probably the first thing you will notice is just how smooth and rounded off the edges are. Previous models have gone for a purely rectangular approach, both in the shape and its dimensions, but instead the sides are curved and it works better for it. Probably the most surprising aspect about this approach is it doesn’t feel like it’s going to fall out of your hands. It’s nice to hold, it’s light and doesn’t feel like a toy. The camera has always been one of the main features of the iPhone so it was obvious it would improve it either way, but the real fun comes from what it’s done with slow-motion footage. Slow-mo was a feature that was introduced with the 5S and while it was fun to play around with at the beginning, there was little reason to use it. Now things are a little bit different. While you record footage as normal, the fun part is making almost every moment seem cinematic thanks 240 frames per second recording. When you consider how intuitive editing is – it switches from normal to slow motion whenever you want it too – expect such video to start popping up more often. It’s probably fair to say that while Apple has positioned its smartphones as premium devices, the reluctance to give them a larger screen may have hampered them somewhat. The 6 (and to an extent 6 Plus) rectifies this, but it’s not a larger screen for the sake of a larger screen. It’s actually important for some of iOS 8′s new features to work properly. Using a third-party swipe keyboard on a smaller screen like the 3.5-inch iPhone 4S is functional, but is hampered by the fact that swipe movements are imperfect. In recent months, it was heavily implied, if not stated, that Apple would be moving towards bigger screen devices. The only problem for developers was it couldn’t specify what the sizes were – or if there were two different phones – without spoiling its press event. For now, the majority of iOS 7 and iOS 8 apps appear fine on screen, but the older you go, the more you realise that most apps still aren’t designed with the bigger screen in mind. Getting up to speed shouldn’t be too much of a challenge for the more established apps, but others may have to play catch up soon. Ok, so this isn’t entirely to do with the iPhone 6, but it is an important point to note considering the amount of, mostly justified, flak it has received. While the original iOS 8 had its problems, and iOS 8.0.1 was an unmitigated disaster, iOS 8.0.2 looks like it has remedied most of the problems, both in bugs and overall performance. Even in older phones like the 4S, it seems to have made things much smoother, but while it’s easier to fix problems when you have hundreds of millions of people using it, it’s a pity this update wasn’t part of iOS 8 from the start and would have saved Apple a number of headaches. We used an iPhone provided by Three. You can get details about it – including pricing - on the Three website. Email “First impressions: Here's what the new iPhone 6 is like”. Feedback on “First impressions: Here's what the new iPhone 6 is like”.